Ώρα για ένα ακόμα βαρβάτο update του Gran Turismo Sport. Όπως ανακοίνωσε η Polyphony, το update 1.06 του Gran Turismo Sport είναι διαθέσιμο από σήμερα και φέρνει μεταξύ άλλων νέα αυτοκίνητα και δυνατότητα offline παιξίματος (αν και για αποθήκευση της προόδου απαιτείται σύνδεση στο ίντερνετ) των livery editor, scapes και campaign. Δείτε αναλυτικά τις βελτιώσεις/προσθήκες παρακάτω και πείτε μας αν παίζετε Gran Turismo Sport! - The following 3 cars have beenadded. - A part of the physics simulation model wasimproved, especially improving controllability of stock commercial models whichexhibit less grip on the road. - Control management of the ‘standard’ ABS settingswas improved, raising drivability under braking conditions. - Control management of rear wheel drive cars withTCS settings set higher than ‘2’ was improved, raising stability at cornerexits. - It is now possible to play the campaign modewhile offline. - In line with the improvements in the physicssimulation model, the difficulty level of the Driving School and MissionChallenge were adjusted. - It is now possible to use the Livery Editor whileoffline. - It is now possible to create and edit Liveries ofcars without having to set the car to be edited as the currently selected car. - A Museum has been added toBugatti in Brand Central. - There is now a warningindicator when the remaining fuel becomes low. - It is now possible to adjustthe balance of sound effects during gameplay. The adjustment can be made in[Options] -> [Sound Volume]. 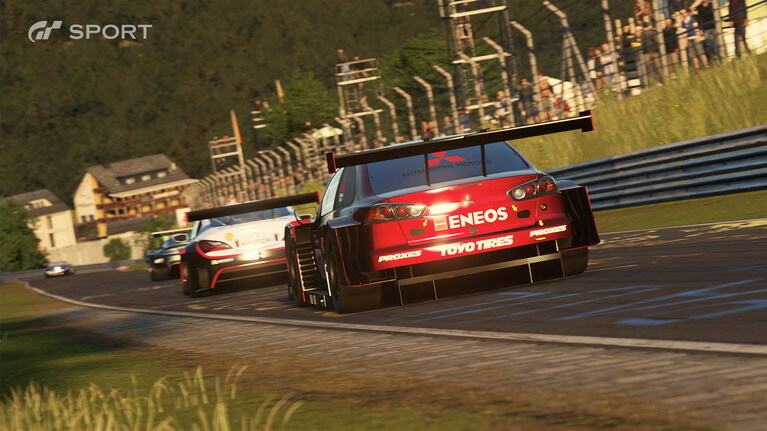 - It is now possible to play withthe Scapes feature while offline. - “Autumn Leaves” has been addedto the featured collection. - It is now possible to download andplayback the replays of top ranking drivers in the Daily Race Qualifying TimeAttack Rankings. - An antenna display nowindicates the connection status/quality in the member lists. - The judgement algorithm of theSportsmanship Rating (SR) has been improved. In the screen indications, it is alsonow possible to see the reductions in the SR of not only yourself but of otherdrivers involved in a contact incident with your car. - It is now possible to select apreset chat text when entering text chat. Various other problems and stability issueshave been improved.